There are many instances when cricket matches were halted under extraordinary circumstances. Over the years, we had seen various stoppages due to different reasons that go over the top of our mind, but yesterday’s incident in a Ranji Trophy match will probably rank among the weirdest reasons ever for a professional cricket match to come to a halt. In one of the most bizarre incidents, Day 3 of the fourth round of the Ranji Trophy match between Delhi and Uttar Pradesh the play being interrupted as a man drove his car into the ground and even got onto the pitch. It is an important fixture between both the teams at Air Force Sports Complex in Palam ‘A’ ground in New Delhi. According to a report, the person was identified as Girish Sharma and he drove his WagonR car straight onto the pitch where the match is being played at. 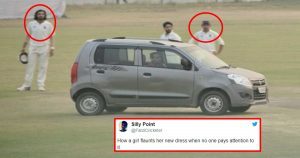 He claimed that he didn’t find any security and was simply lost for direction, as he entered the field of play with his car, however, he drove his car twice over the pitch despite attempts by players and umpires to stop him. As the Delhi fielders and UP batsmen, Akshdeep Nath and Imtiaz Ahmed – ran to save themselves from getting hit by the car, Girish – who later told police that he works for the Tata Consultancy Services (TCS) at its Parliament Street branch – tried to make an ‘8’ on the pitch as if he had come for a driving test. The match boasted the presence of international stars such as Ishant Sharma, Gautam Gambhir, Rishabh Pant and Suresh Raina, who appeared befuddled over what transpired in front of them. 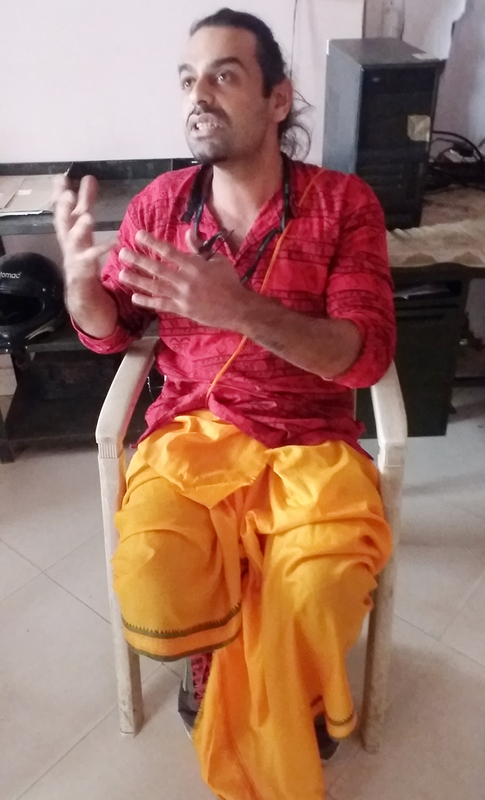 The allegedly inebriated man was first detained by the Airforce Police before being handed over to the Delhi Police for interrogation. The incident happened at 4:40 PM local time, about 20 minutes before the close of play. No further play was possible as the officials inspected at the damage done by the vehicle. The match resumed after a brief halt after an inspection of the pitch as it was found out to be unharmed and ‘playable’ after averting potential danger. When you don’t treat dulhe ke fufa ji well. Car Stops Play! New entry in cricket’s book. That must be a first – “Car stops play”. 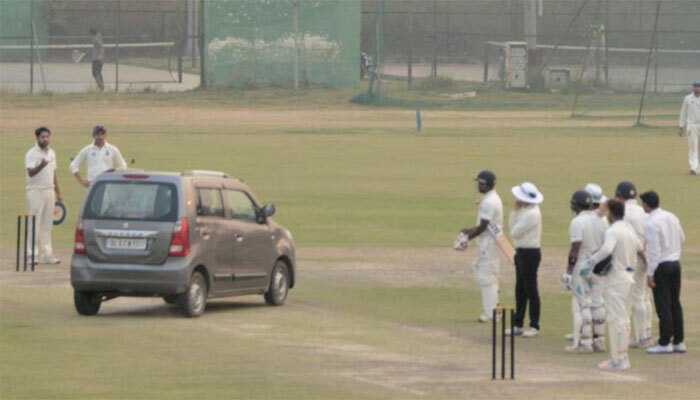 Ranji Trophy game between Delhi and UP held up by man driving to the pitch at the Air Force ground. a car drove into the middle of the pitch!! Bhai Delhi mein kuch bhi ho sakta hai! Looks like he is looking for directions: Bhaisaab, zara bataiye G23/7, sector 4, New Palam Extn kaha hai? In cricket its Cover Drive. Both teams will eye a win on the final day providing weather stays clear and no more cars run on the pitch. The match was shifted to the Palam ground as Ferozshah Kotla was engaged for hosting the first of the three T20Is between India and New Zealand on Wednesday. The ground is adjacent to the Palam underpass, which is one of the busiest routes in New Delhi, connecting the Airport. 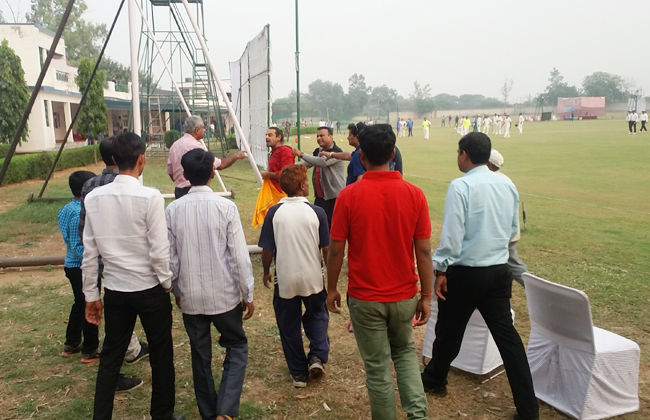 The ground is largely used for visiting teams to train and practice in the IPL.